On the 15th November Jo Bumbak was announced as the State Government’s Infinity Awards Waste Champion for 2018. The award is given to an individual who has demonstrated outstanding commitment and contribution to better waste management. After seeing up to 60 per cent of all fresh grown produce go to waste in Carnarvon’s horticultural district, Jo Bumbak decided to take action. Working with local growers, Jo rescued fruit and vegetables deemed too unappealing for sale in supermarkets—using produce which would have otherwise been dumped and left to rot. 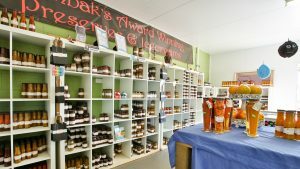 Last year, Bumbak’s Preserves and Ice Creams bought 36 tonnes of fresh mango, banana, tomato, chilli and capsicum, turning them into award winning products for sale. Jo has capitalised on growing consumer concern about where food comes from, winning over 100 awards at the Perth Royal Agricultural Show and providing support for Carnarvon farmers. “Our family has been in farming for 60 years and would love to remain viable long into the future,” says Jo. “Through our business we are aiming to reduce waste, improve financial outcomes for industry and create delicious products that contain nothing artificial and no preservatives for visitors to enjoy all year round,” she said. Jo’s contribution goes far beyond delicious food, including positively promoting Carnarvon and its horticultural industry by using the store as an educational tool for locals and tourists to the region. “It is my passion to ensure Carnarvon is a successful and thriving town where visitors experience all the unique and amazing things that make it a paradise place,” said Jo. Bumbak’s created over 140 preserves, 12 ice cream varieties and 6 fruit leathers in 2018, utilising over 100 varieties of local produce, with more exciting innovations to come through products, processing and packaging in the future. Bumbak’s is a must-do in Carnarvon for any visitors. The Infinity Awards are coordinated by the Waste Authority WA and acknowledge and celebrate the outstanding achievements of Western Australians working towards a better waste future through improved waste practices and innovative waste solutions.